No, not literally… get your hands off! I’ve never claimed to be a makeup artist nor hold any aspirations to cultivating a talent in this field. I simply don’t have it in me. Whether it’s cosmetics or clothes… I often struggle to merge individual pieces into a successful ensemble. Or at least, one that does anything justice. 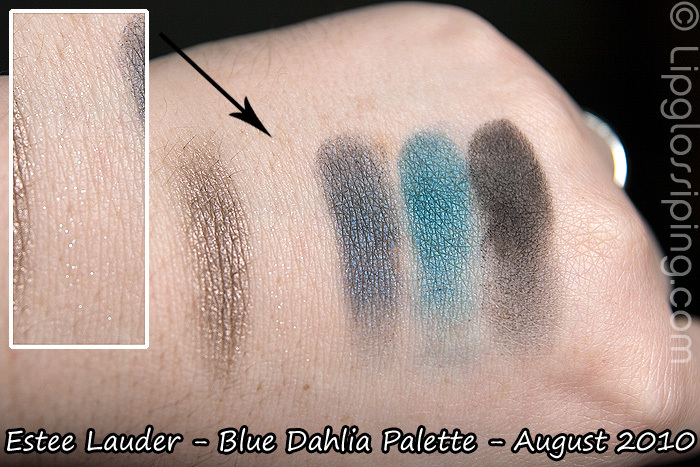 I’ve been handswatching and ‘playing’ with this beautiful Estee Lauder Blue Dahlia palette that was in my goodie bag of pieces from the upcoming Tom Pecheux Autumn collection (releasing in August). It’s a daring choice of shades for a palette… it’s strong and needs to be worn with confidence. I can do that, but I’d love a little bit of peer guidance to point me in the right direction. How would you put together a look with this palette? Would you use all the shades at once? or just a few at a time. I think I’m struggling with incorporating those two strong blues in one look. Can it be done? How would you attempt it? Such a pretty palette, it looks gorgeous! – bottom lid of the eye, navy & teal together. Starting with teal from the inner corner and halfway continuing with the navy. I always like palettes that carry no less than 4-5 colours as you need them all for a truly multi-dimensional effect! I’ll list the shades in the order you should apply them. 1. Teal – inner half of lid. 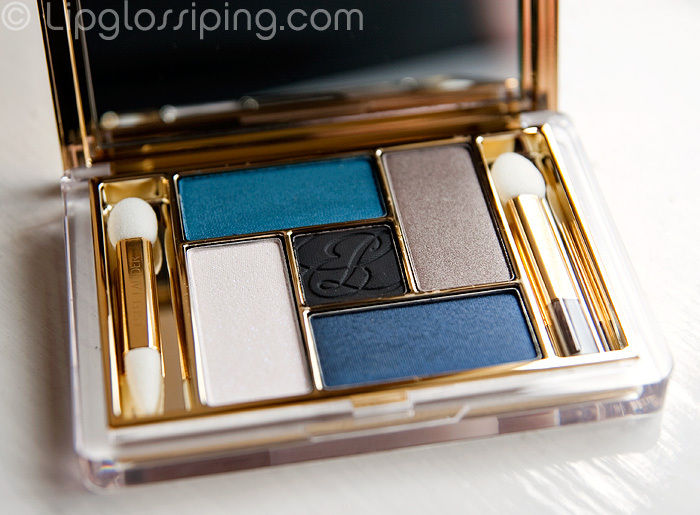 I don’t even have this palette, haha.. but I have the Dior 5-shadow quads & I usually find tehre’s a place for all shades. I probably wouldn’t wear them all at once, I’d do the teal on the lid, navy in the crease and lower lashline, the matte black to deepen the outer corner, and the light iridescent colour for a brow and inner corner highlight. And you could also do the teal on the lid with the taupe in the crease, maybe with the itsy bitsy teensiest bit of the black to deepen it. I like doing a blue on the lid with a bronze in the crease, so this could be a slightly different interpretation of that and again, the light colour for an inner corner and brow highlight. You could choose whether you want to do the taupe or the teal on the lower lashline – maybe even the navy! Another idea: taupe colour on the lid, and back in the crease with the iridescent colour layered over the top. Taupe on the lower lashline with some black at the outer corner if you want, or the teal on the lower lashline to tie in with that teal-y layering colour. White as a highlight in the inner lower lashline, as well as in the inner eyelid. I think you should definitely listen to Silhouette Screams, she has brilliant ideas, I would have suggested some of those myself. I think it would be very difficult to use all shades at once as it’s a dark palette, but the blues together with the black (either in crease or as eyeliner) and the lightest shade to highlight, or the taupe with the darker shades together would look great too. Let us know what you come up with. – Shimmery Teal on the lower lashline, with whatever colour you feel comfortable on the lower waterline (I don’t personally like black waterline on myself but i love it on people. – Lower lashline: the taupe thing. Although I personally would want to see something warmer there, a more coppery golden colour. I’m going to skip the whole “useful comment” thing and stop talking now 😛 There are already a ton of lovely tips for how to wear this; I’m sure you don’t need me! I don’t know what exactly I’d do, but I’d definitely smudge the teal and the black on my lower lashline, and the black on the top lashline too. Maybe with the taupey colour on the lid, and then in the crease with the navy. But that white is a bit pointless. taupe color all over the lid , dark black in the outer V, teal color lower lash line…stunning colors ! I can’t see a good highlighter ther so probably shroom by Mac for the area under the brow !